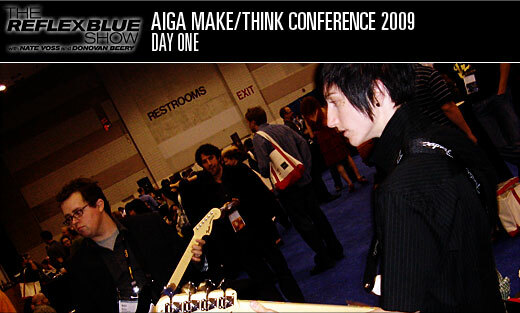 Download The Reflex Blue Show with Nate Voss and Donovan Beery, AIGA Make/Think Special: DAY ZERO or click here to subscribe to The Reflex Blue Show from the iTunes Music Store. After speaking with Mike Adair and Bob Holt at Hallmark, the next stop on our Kansas City podcast tour was to find Stefan Mumaw at Reign. As we pulled up to the entry, we noticed Hammerpress Letterpress and Design Studio, and decided to stop by a bit later in the day to see the presses. For now, it was up to the third floor, in what may be the most square footage I have ever seen for a four-person design shop. But the guitars, massive open spaces and white boards everywhere told us they were serious about the creative. Even though Reign has only been around for a few months (Stefan just moved to Kansas City this year), you can already sense that it won’t take long for them to make their mark on the city’s design scene. But Reign was only part of what we wanted to speak about, we mainly wanted to talk about the other hobbies Stefan has, which seems to be writing design books. 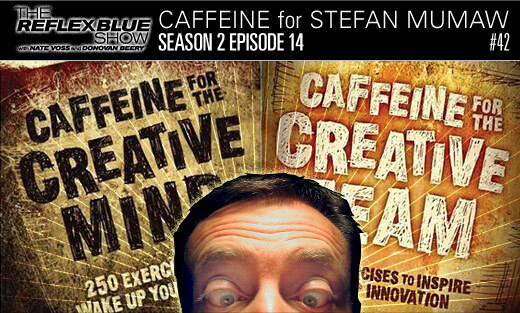 Starting with Simple Websites and Redesigning Websites, Stefan then moved on to teaming up with Wendy Lee Oldfield and creating two books that seem to be everywhere in the design circles now: Caffeine for the Creative Mind and the just released Caffeine for the Creative Team. If you ever run out of creative, these books will give you the pick-up you need to get going again, and this is what we mostly talk about. When you create two books like these, it’s really all we want to cover. After the fact, we realized what we should have talked about is if Stefan Mumaw is a hobo. Let’s consider that Stefan just moved across country and is working in a basically vacant building. Now let’s remember that Stefan took us to Jack Stack BBQ for lunch and confessed that he is all about the Burnt Ends when it comes to his BBQ. Aren’t burnt ends like the pieces of meat that fall off the real food? Like table scraps? And now we remember that this episode of The Reflex Blue Show is the only one being released during 36 Hobo week? Not sure if this is all coincidence. Finally we bring another student tip from Mig Reyes. This may also make Mig a hobo. Sorry. 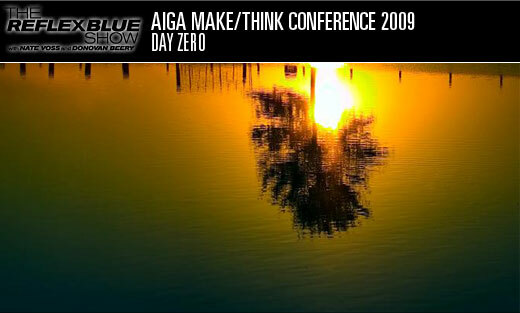 Our roadtrip returns in a few weeks with Ann Willoughby, but look for some sort of special episode from the AIGA Make/Think Conference in Memphis between now and then. And as always, leave your thoughts and opinions in the comments below. And anyone who has more information on what burnt ends are, and why they taste so good, please share. Download The Reflex Blue Show with Nate Voss and Donovan Beery, Season 2 Episode 14 (29 meg) or click here to subscribe to The Reflex Blue Show from the iTunes Music Store. The upcoming weeks look to be busier than usual for 36Point, so I thought I would post the events in case anyone wants to stop by to say hello. Or, if you follow us on Twitter, you’ll have a better idea of the things we may be talking about this month and next. Nate and I will be at Blue Planet Natural Grill in Omaha for A TOMS Shoes Event (decorating some shoes obviously), along with some local celebrities. All shoes will be auctioned for charity to benefit the Green Omaha Coalition. I had so much fun painting that toy a few months back, that I jumped at the chance to be part of the We Ain’t Plastic! exhibit in Lincoln. The exhibit will display over 40 different local artists’ creations (Nate and I both included). A sneak peak at mine can be seen above. We’re hearing rumor of a potential Omaha exhibit later, but nothing confirmed. We hope it happens, as our schedules don’t work with us being there that night, but we would love to see what the other artists create. Many of these will be for sale, with some proceeds going to charity. We are thrilled to be one of twenty speakers given complete freedom in sixty seconds of main stage time during the AIGA National Conference in Memphis. It’s the “20/20” segment of the opening night kick-off. We’ll also be hanging around the conference the rest of the time and hope to meet some new people there. Are we the first Nebraska-based designers to get main stage time? Please let us know if we’re following in footsteps here. Spokane Falls Community College, as part of their Educational Speaker Series, will be doing a viewing of our PORTFOLIOWN’D podcast. Following this, there will be a live (via video conferencing) Q&A with Nate, myself and special guest Steve Gordon.